IST stands for incremental state transfer. When a node of the cluster leaves the cluster for a short period of time and then rejoins the cluster it needs to catch-up with cluster state. As part of this sync process existing node of the cluster (aka DONOR) donates missing write-sets to rejoining node (aka JOINER). In short, flow involves, applying missing write-sets on JOINER as it does during active workload replication. 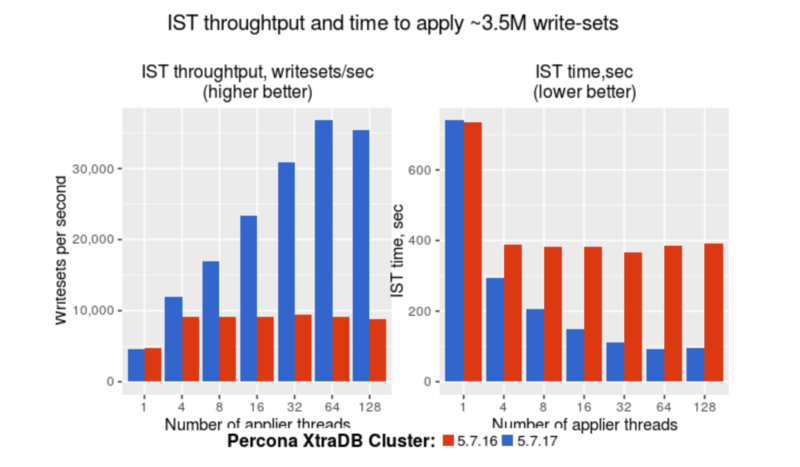 Percona XtraDB Cluster / Galera already can apply write-sets in parallel using multiple applier threads. Unfortunately, due to commit contention, the commit action was serialized. This was fixed in the above Percona XtraDB Cluster release, allowing commits to proceed in parallel. IST uses the same path for applying write-sets, except that it is more like a batch operation. Let’s look at IST performance before and now. ….. repeat steps 3-6 with different values of N.
Percona XtraDB Cluster 5.7.17 significantly improved IST performance. A faster re-join of the node effectively means better cluster productivity and flexibility in planning maintenance window. So what are you waiting for? Upgrade to Percona XtraDB Cluster 5.7.17 or latest Percona XtraDB Cluster 5.7 release and experience the power!